Searching for replacement Oki toner cartridge does not have to leave you strapped for cash. We have a low price guarantee which means that our toner for the Oki B4600 laser printer are incredibly inexpensive. By running an effective online store and keeping our operating costs as low as possible, we are able to provide you with Oki B4600 toners which will cost noticeably less than the supplies you may find at your local technology or computer hardware stores. We feel you shouldn't need to give up on build quality to buy a reasonably priced Oki B4600 printer cartridge. Thanks to our no quibble guarantee on toner you'll never need to take any chances. Here at Cartridge Save we like to help you save money without having to sacrifice on build quality and functionality. Place your now with Cartridge Save and start to save! The Oki B4600 is a laser monochrome printer capable of print speeds of up to an impressive 27 pages per minute and resolution crispness topping out around 2,400 x 600 dpi. A 266 MHz processor and 32MB of internal RAM help to power the B4600's speed and accuracy with memory expansion options of up to 288MB of RAM. Portability options include parallel and USB standard with Ethernet networking as optional. The Oki B4600 is compatible with most Windows and Mac operating systems. A compact, stylish black design that weighs in at a mere 10 kg, the Oki B4600 is perfect for any professional home office or small to mid-size business. An outside frame measuring roughly 35 cm tall x 22 cm wide x 40 cm deep, the B4600 can fit comfortably on any small counter or desktop. A standard input tray of 250 sheets can handle both legal and letter size documents and my be expanded even further with an optional 500 sheet tray for minimal user maintenance during print jobs. The Oki B4600 toner and image drums are configured separately to minimise user operating costs while both remaining convenient and easily accessible. The Oki B4600 has an extraordinary duty cycle of 40,000 pages per month, much higher than some other machines in its same classification. The Oki B4600 toner cartridges come in a standard 3,000 page life cycle as well as a high-capacity 7,000 page per month version. 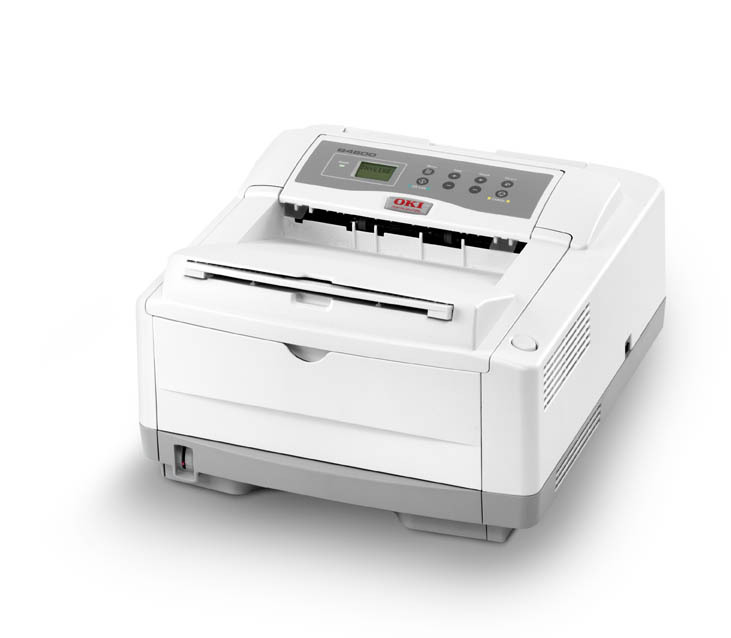 The Oki B4600 will not print in colour. Although print speeds are impressive and paper capacity is optimal for small offices, this workhorse of a laser monochrome printer may not be ideal for larger offices due to user maintenance requirements.